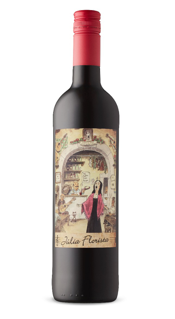 Portuguese wine Júlia Florista launches in Ontario, follow up to Porta 6. Easter wines under $9.00! 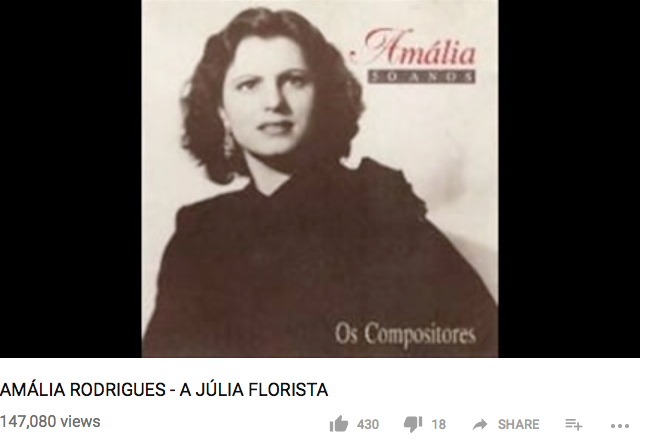 Júlia Florista (1883-1925): Flower seller during the day, Fado singer at night. 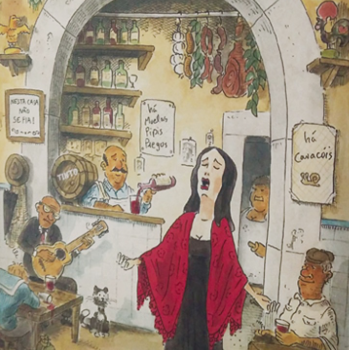 A true bohemian soul known in the old streets of Lisbon and taverns alike for her breathtaking fado singing. 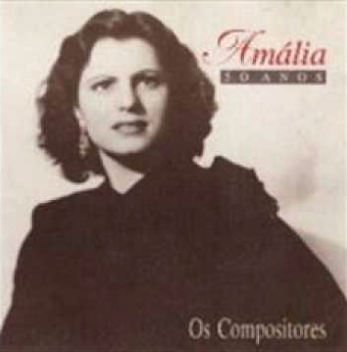 Her life and death had all the ingredients of a fado song… (Although short lived she left us 2 precious vinyl records named: “Espirito Fado”). We dedicate these wines to her memory. Fresh and fruity, with aromas with tropical fruit and citrus in the foreground. On the palate, enjoy flavours of passionfruit and citrus, with refreshing minerality on the finish. Serve with grilled fish or seafood. Bright ruby, aged color with pale gold and tawny tones. Fruit aroma, vegetal hints. Medium body with elegant spices and delicate finale. 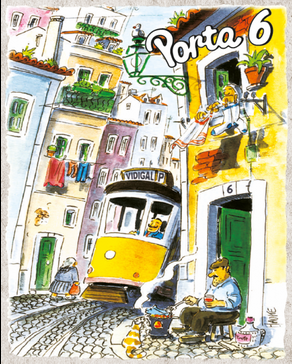 Brand new to our market, a new Portuguese wine called Porta 6! 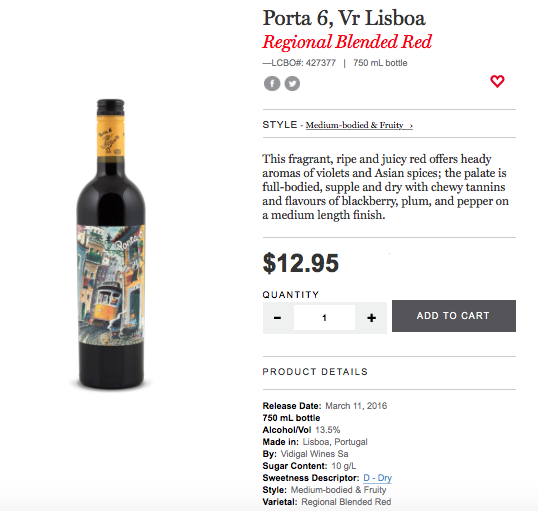 “Porta 6 a 90 POINTER”, claims Decanter Magazine is from the region of Lisboa. It brings great taste, super value, and street art all together. On this week’s audio podcast…Ancient Vines,Historic Wines, Antiques, Beringer Vineyards, Taylor-Fladgate Port plus a great new find, Porta 6. Victoria Ivanyushkina, will be calling in from the UK.Victoria is the Director of BinCellar Limited and fills us in on our latest discovery. Our radio show “Taking Life One Sip at a Time” is an radio audio podcast. On the show we share with the audience our passion and sense of adventure for delectable and fascinating foods, wine, spirits and lifestyle discoveries. Our motto “everything in life somehow comes back to the vine. 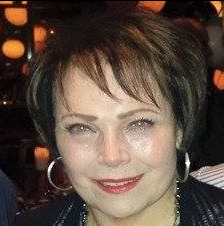 Living life large and with integrity intertwined with a variety of guests from around the globe.Chatting with celebrity chefs and winemakers, exotic food purveyors, artists, musicians, sports personalities, lifestyle advocates and fashion icons be sure to tune in for an hour of lively topical and educational conversation. https://www.thewineladies.com/wp-content/uploads/2018/03/Screen-Shot-2018-03-22-at-7.32.38-AM.png 352 347 Susanne Seelig-Mense https://www.thewineladies.com/wp-content/uploads/2017/08/WineLadiesLogoTransparent.png Susanne Seelig-Mense2018-03-22 07:24:022018-03-22 12:19:01Portuguese wine Júlia Florista launches in Ontario, follow up to Porta 6. 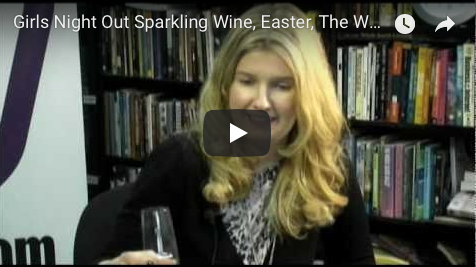 Easter wines under $9.00! 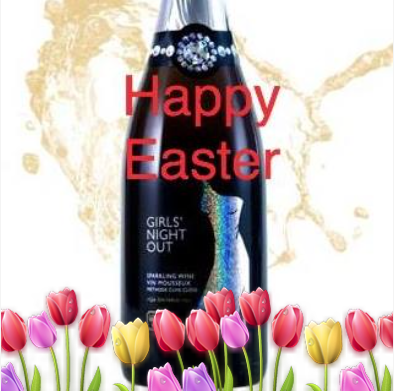 Add a little sparkle to Easter with Girls’ Night Out Sparkling and chocolate. Add a little sparkle to Easter with Girls’ Night Out Sparkling and chocolate. Join us as we explore the pairing of these two delectable treats. Two of life’s greatest pleasures, wine and chocolate come together in a blissful union! Perhaps not quite so mainstream as wine and cheese, but definitely as delish, or decadent if not more! Just in time for the Easter holiday! In studio to shed some light on this delectable duo, Doug Beatty Vice President Marketing of the highly successful Girls’ Night Out wines from Lake Erie North Shore, Ontario and Colio Estate Wines as well as Marketing Manager Alison Modesto who will reveal the woman’s point of view. Check out the Girls’ Night Out Face Book Fan Page too for great offers, contests and more. Just like you! Only $14.95 (with deposit) and available at any one of 14 Wine Region of Colio Estate Retail Boutiques or an LCBO store near you. Did someone say sparkle? It’s time to bring out the glitter (and sequins), grab your friends, and get ready to flaunt it with this wine that’s both elegant and bubbly — just like you! What should I pair it with? Perfect for all of your celebrations, you can up the glamour factor and serve this festive favourite with a tray of oysters or steaming hot bowl of mussels. Taste: Bursting with crisp apple and citrus, lively in the mouth with tropical notes and a racy tartness that compliments the playful bubbles. https://www.thewineladies.com/wp-content/uploads/2011/04/Screen-Shot-2018-03-18-at-9.00.33-AM.png 391 394 Susanne Seelig-Mense https://www.thewineladies.com/wp-content/uploads/2017/08/WineLadiesLogoTransparent.png Susanne Seelig-Mense2018-03-17 15:21:002018-03-18 09:25:29Add a little sparkle to Easter with Girls' Night Out Sparkling and chocolate. 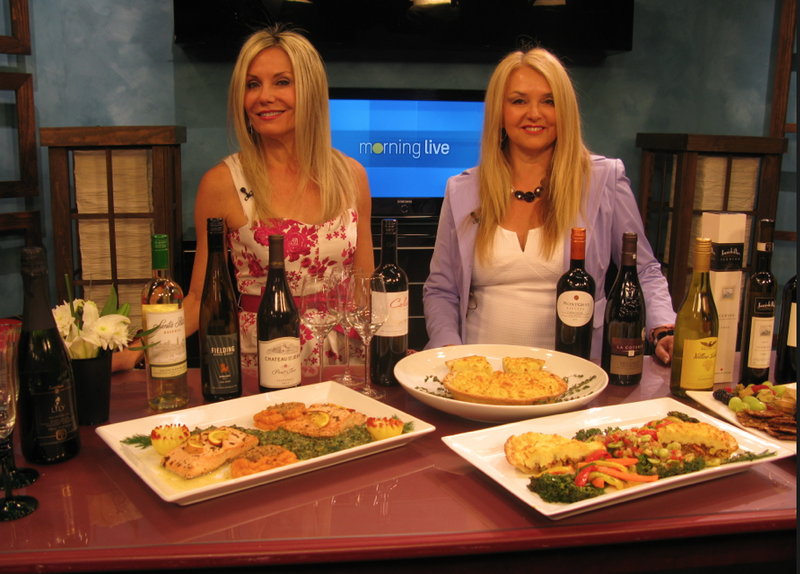 The Wine Ladies on CHCH TV Morning LIVE with Annette Hamm. 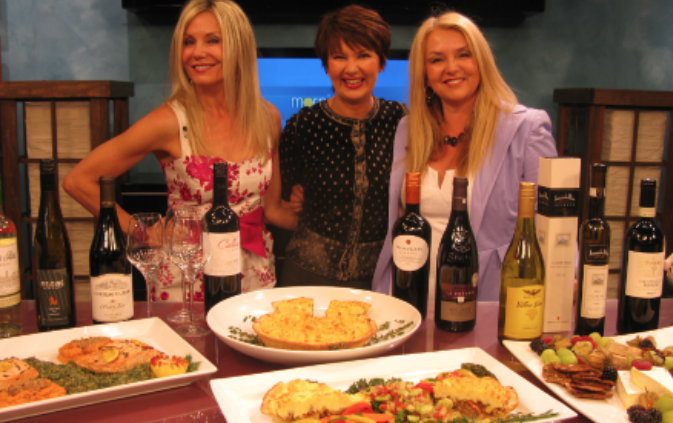 CHCH TV Appearance Easter Wine and Food Pairings. Happy Easter Everyone! Watch the episode here! 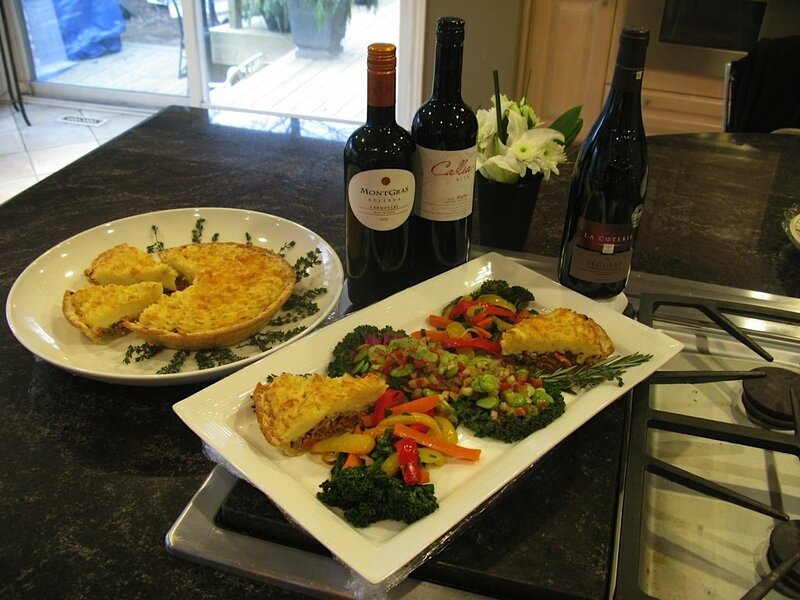 As we know Easter is a time when family and friends get together usually surrounded with some wonderful dishes, and in many cases delicious wines of course.We thought we’d share with everyone a couple of wonderful dishes, our second office…from our office away from the office home Wholefoods Market in Oakville…. always freshest, organic foods, delicious recipes… thank you to France, Chef Ron and the whole crew! Our Good Friday or Sunday Easter brunch to include a Citrus Glazed Salmon with Fresh Herbs, Lamb Shepards Pie topped with mashed potatoes, a selection of cheese and a choice of Vanilla or Chocolate Bunny cakes! What a cornucopia of delicious treats. With these plates we’ve selected a range of wines, from $12.00 to $20.00, nothing here is over the $20.00 mark, all super value wines, versatile and with an international flair! Price: $17.95. 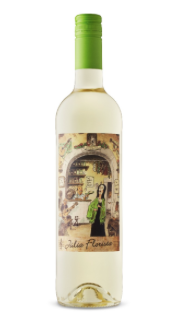 Can be purchased at the Colio Wine Boutiques ( 14 locations across Ontario, one in Hamilton, two in Burlington) as well as the LCBO store locations. Winery/Region: Colio estate Wines first opened their doors in 1980, one of the first to get their winery licence after prohibition. Located in lesser known region of Lake Erie North Shore, in Ontario. The region has the same latitude as Tuscany in Italy. 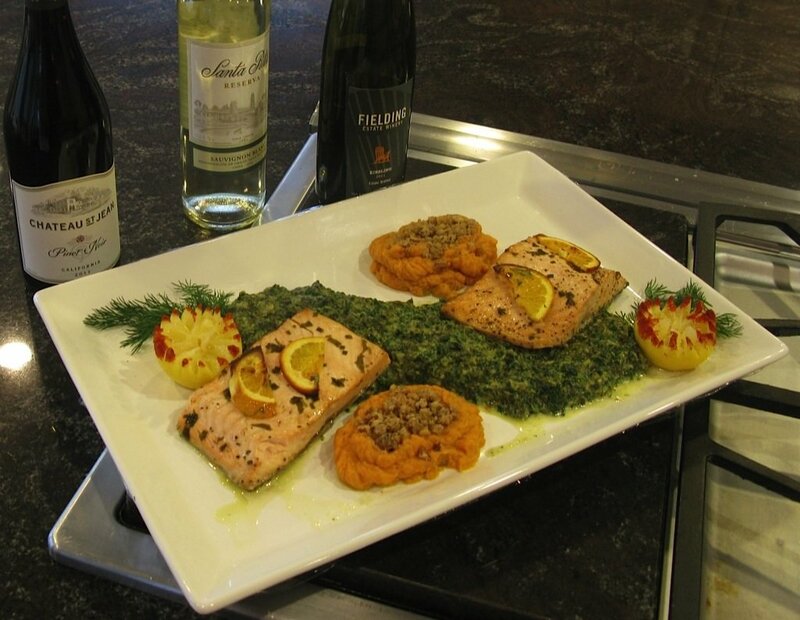 On Good Friday many folks choose to eat fish for today and we have here a magnificent Citrus Glazed Salmon, marinated in fresh orange and orange zest sauce, then baked and with herbs including parsley and chives. Our wine pairing for this magnificent dish include a selection of two (2) white wines, the Santa Rita Reserva Sauvignon Blanc 2011 from Chile, Fielding Estate Winery Riesling 2011 plus for the red wine lover at your Easter table form California, the Chateau St. Jean Pinot Noir 2011. Here we’ve brought in a super value Sauvignon blanc, we’ve just returned from Chile, and although the country may be long and skinny, it is big and fat on flavour and great value! This Sauvignon Blanc pairs great with this preparation, with notes of juicy grapefruit, fragrant citrus, good acidity with a touch of herbal notes, a natural for the salmon. Tasting/info: Sauv Blanc pair great with this preparation, with notes of juicy grapefruit, fragrant citrus, good acidity with a touch of herbal notes,a natural for the salmon. Winery/Region:Founded in 1880, stunning property in very important Maipo Valley.The grapes from Casablanca region of Chile, one of the finest producing regions in the world for white wines. 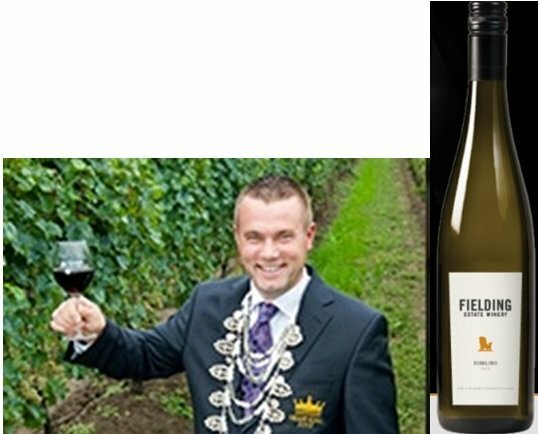 Tasting/info:Will also pair lovely with the salmon, shares the wonderful citrus notes, a little peach, delicious, also good acidity.We do Riesling really well here, Fiedling is located in Beamsville, Niagara. Moving onto the next dish, one of the more popular dishes for Easter often involves lamb, whether a leg roasted, rack or like we have here Whole Foods favourite, fresh Lamb Sheperds Pie, sauteed with onions and fresh herbs,thyme parsley, cheese and topped off with a mound of mashed potatoes. Our selection includes a Malbec from Argentina as well as a Carmenere from Chile, having just come back from those regions we are Mad about Malbec in Mendoza and Crazy for Carmenere in Chile. Our recent trip to Argentina included a trip to Callia in San Juan province. Here vineyard manager Gustavo Matocq explains the terroir that delivers such a beautiful Malbec. Tasting/info: Medium bodied, smooth, clear deep ruby colour, blackberry, plum,hints of oak and spice. Winery/Info: Callia, is located in province of San Juan,Argentina, it is one of the wineries of Salentein Family of Wines with properties in Mendoza. San Juan 2nd largest wine region in Argentina after Mendoza. Another awesome wine pairing with the Lamb Shepherds Pie is the “hottest” grape to come from that long and skinny country Chile, the Carmenere. 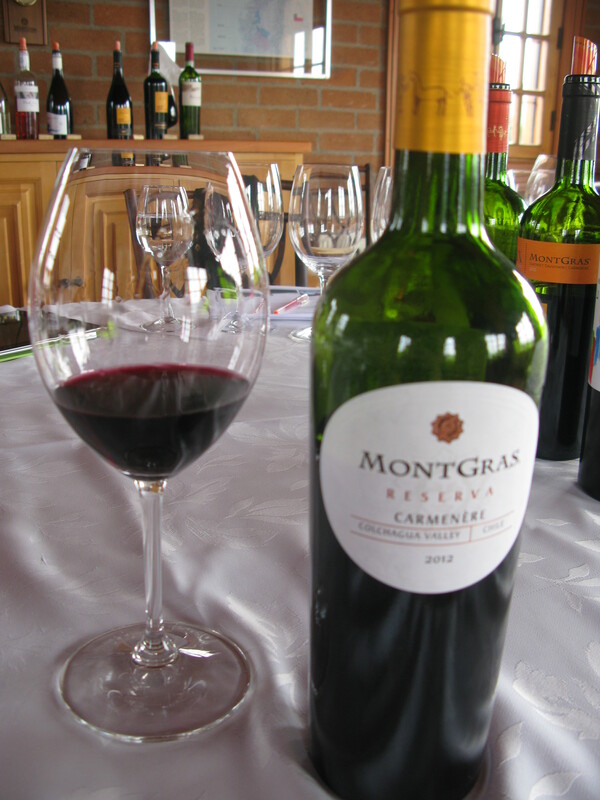 Our pick the MontGras Reserva Carmenere 2011. Our recent trip to Chile included a visit to MontGras. Price: $11.95 Available at the LCBO. Tasting/info:The Mont Gras Properties, have vineyards in 3 major Chilian wine regions, this one from Cochagua, known for producing high quality Carmenere and Syrah.The vineyards are protected by coastal mountain range and Andes, ideal meditteranean climate, rich in color, aroma, taste with soft round tannin. 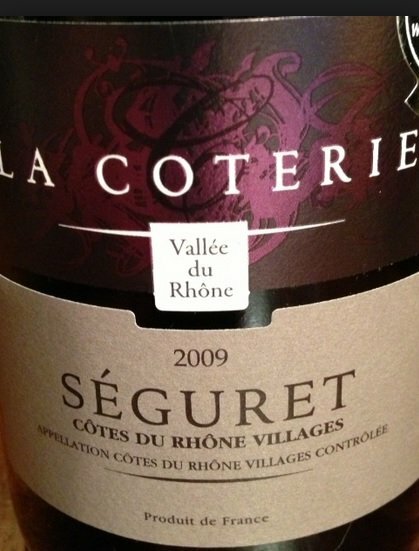 The wine is spicy, medium body, fruity, ripe fruit sweetness,with hint of vanilla, and toasty flavours. Price:$16.95. Available at the LCBO. A Vintage released March 2013. 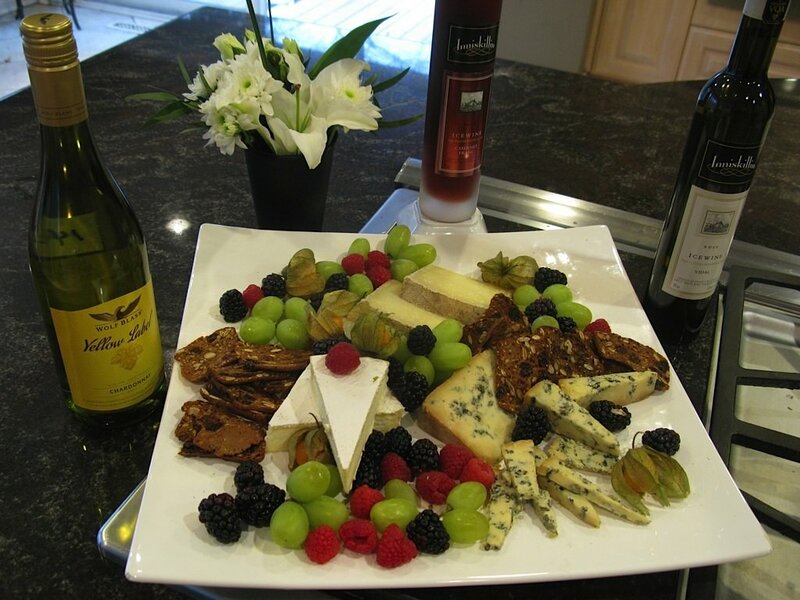 Onto “les fromage….” brought in 3 today, courtesy of cheese spcialist Sandra from Whole Foods Oakville, all Canadian and all very different,Comfort Cream, Blue Haze and a hard grainier cheese the Toscano. Price: $15.95. Available at the LCBO. Tasting/info: Everyone knows Wolf Blass, one of the most successful brands, great value, reliable and excellent with this cheese.Full bodied, rich, tropical fruit, rich with buttery oak aromas,hint of spice, echoes creaminess of the cheese. A little blue goes great with a little sweet! Icewines are beautiful with this cheese and the Inniskillin Vidal Icewine is an excellent choice. This is a smoked blue cheese, made from cow’s milk, that is produced by the the monks at the Abbaye de Saint-Benoît-du-Lac in Quebec. 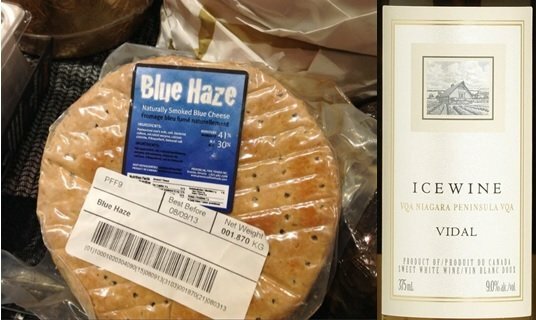 Blue Haze is aged 10 weeks at the Abbaye then it is shipped to Provincial Fine Foods in Toronto. There it is packaged in Cryovac to set the curds and it is held for 4 weeks to firm. After that, it is transported to Hansen Farms in Cayuga, Ontario for smoking. The journey is worth it. The result is a smokey rind that transitions into a creamy salty and sweet center enhanced by the special tang and flavor of the blue veins. It all comes together so nicely. 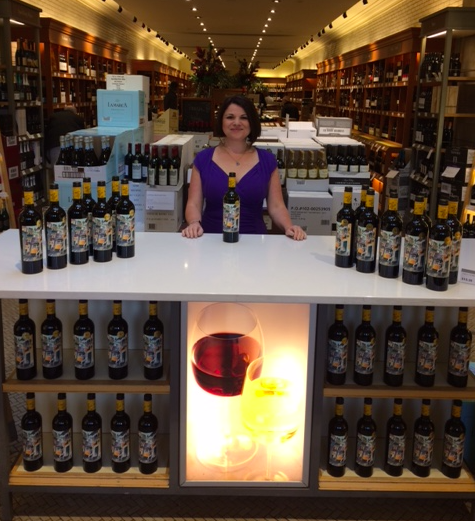 Price $49.95 Available at the LCBO and at Inniskillin in Niagara-on-the-Lake. 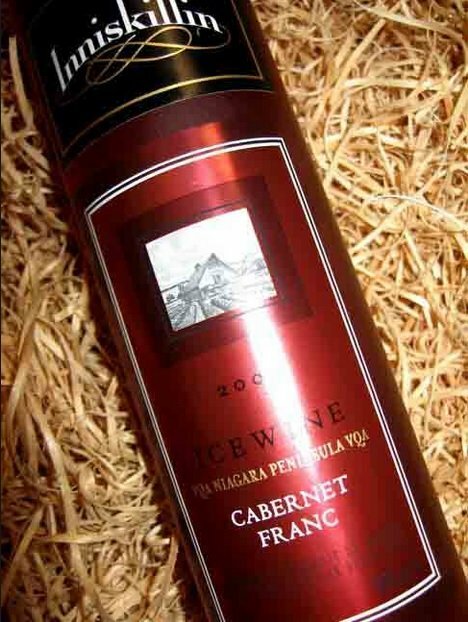 Tasting Notes/info: The 1989 vintage of this Icewine won the Grand Prix d’Honneur at Vinexpo and put Canada on the global wine map. Delicious creamy peach, candied citrus peel and honey flavours. Delectable with raspberry mousse, pear tart or an assertive cheese such as Gruyère. A little blue goes great with a little sweet! Icewines are beautiful with this cheese. 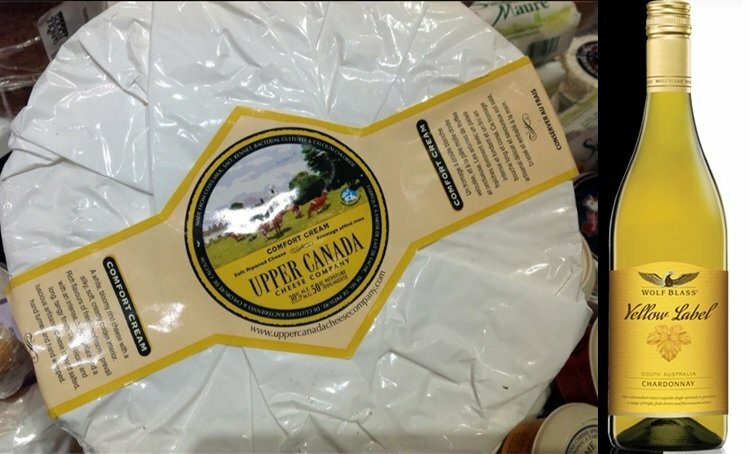 Monforte Toscano, produced by Monforte Dairy located in Stratford pasteurized, sheep firm, natural rind, pressed, cooked. Price: $12.95. Available at the LCBO. Vintage release March 16th, 2013. Price: $99.95 Available at Inniskillin in Niagara-on-the-Lake. Tasting/info: Most people think of icewines being made out of typical white grapes, Vidal and Riesling but here we’d love to share with you an incredible icewine made with Cabernet Franc grapes.Soft crimson in colour, our Cabernet Franc Icewine displays alluring aromas of raspberry and plum with hints of figs. Full bodied, the intense flavours of berries and rhubarb marry with a touch of pepper and spice on the extended silky finish. America’s #1 selling Chardonnay for 20 years and counting! Handcrafted from 100% Jackson Estates grapes. The grapes grown in the Kendall-Jackson vineyards along the cool coastal growing regions of Monterey County, Santa Barbara County, and Mendocino County. Vintner’s Reserve Chardonnay is fruit-forward, divinely complex, approachable and exceptionally food-friendly. 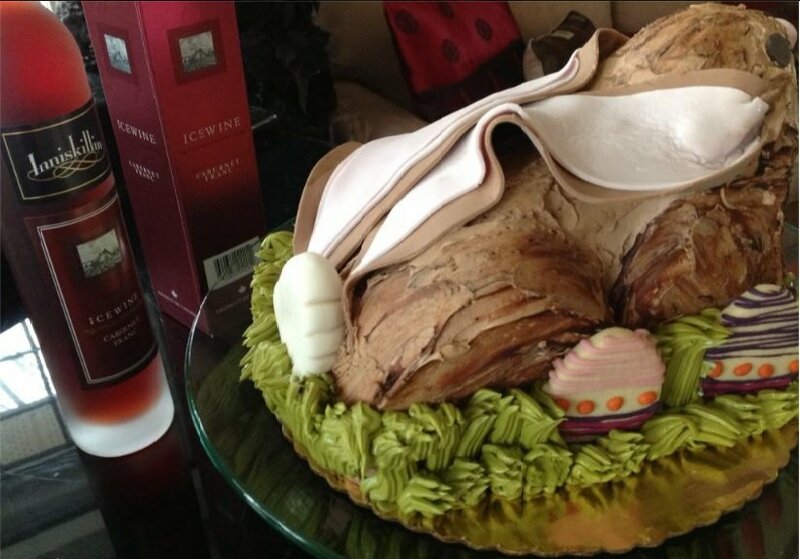 Perfect for Easter celebrations! Randy Ullom shows The Wine Ladies the Chardonnay. In 1993, Randy was hired by Jess Jackson. 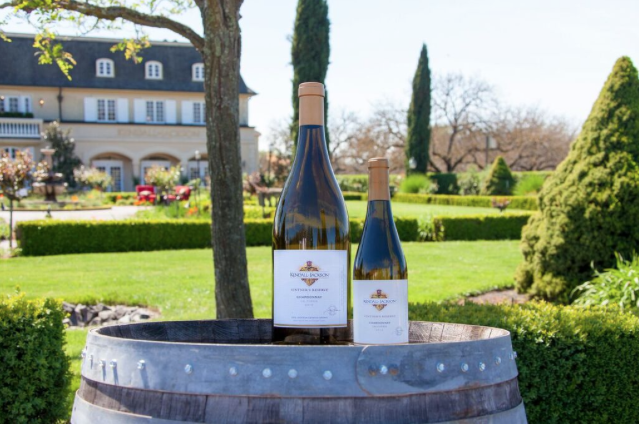 When Jess made the first vintage of Kendall-Jackson Vintner’s Reserve Chardonnay, his goal was simple: He believed that regardless of where you live – whether it be Sonoma County or South Carolina – everyone deserves a great “affordable luxury.” To him this was the great American wine. In 2017, Randy reached a milestone – 25 years working for the Jackson Family – in the same year Kendall-Jackson celebrated 25 years producing America’s number-one selling Chardonnay. This evening’s concert is a musical journey from the 50’s to the 90’s. 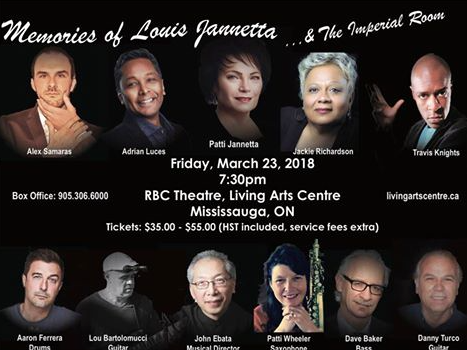 Patti Jannetta will share warm stories of her father Louis Jannetta and his life among the stars as show business Maitre D’ at the iconic Royal York Hotel Imperial Ballroom. Memorable music will have guests travelling down the ‘historical steps of musical time’. Listen to Patti Jannetta at 37:43 minutes in the show. 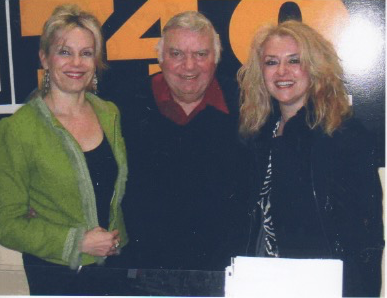 Listen to excepts from our radio interview with Louis Jannetta on AM740 back in 2005. Listen to Louis Jannetta at 44:29 minutes in the show. 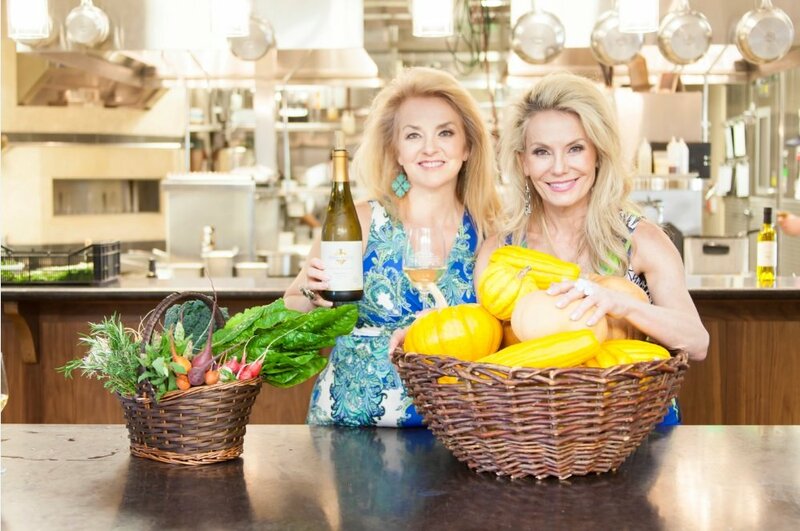 Our radio show “Taking Life One Sip at a Time” is an radio audio podcast on which we share with the audience our passion and sense of adventure for delectable and fascinating foods, wine, spirits and lifestyle discoveries. Our motto “everything in life somehow comes back to the vine and to live life large and with integrity is intertwined with a variety of guests from around the globe… Chatting with celebrity chefs, celebrity winemakers, exotic food purveyors, artists, musicians, sports personalities, lifestyle advocates and fashion icons be sure to tune in for an hour of lively topical and educational conversation. https://www.thewineladies.com/wp-content/uploads/2018/03/Screen-Shot-2018-03-13-at-6.36.41-PM.png 353 563 Susanne Seelig-Mense https://www.thewineladies.com/wp-content/uploads/2017/08/WineLadiesLogoTransparent.png Susanne Seelig-Mense2018-03-14 12:29:012018-03-14 13:15:04Don't miss...Memories of Louis Jannetta and The Imperial Room, March 23rd. Happy 150th Birthday Canada! 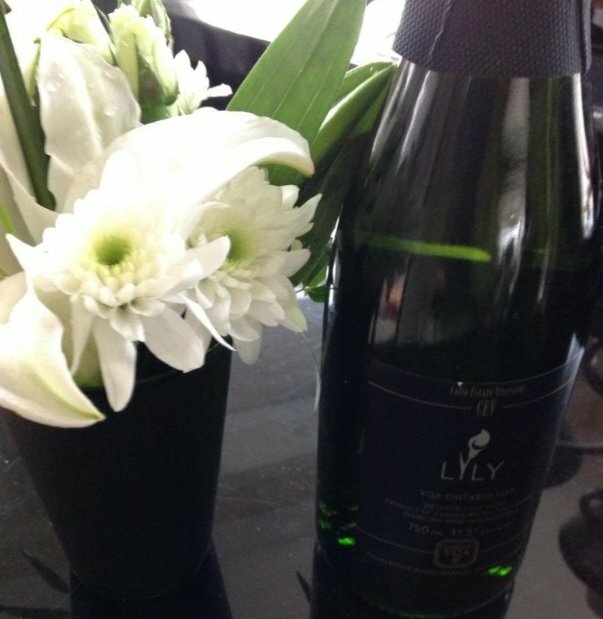 We continue our celebrations from coast to coast with birthday bubbly! We are so blessed in this beautiful and bountiful country we call our home.We honour you Canada with bubbly from across the nation! Last issue we highlighted the two major wine growing regions here in Canada, Ontario and British Columbia. Together these two provinces produce over 90% of our wines. In the vinous world a great source of pride. Our wines consistently garner major awards in international competitions and the admiration from many a wine critique across the globe. Way to go Can-a-da! We make amazing wine eh? Yes, we do and it doesn’t stop there, hold onto your tuque! Strong winds prevail and there is often snow enough to igloo the vines! We are talking about Nova Scotia. The province that hugs the Atlantic side of the continent. It’s very much about location, location, location! Nova Scotia’s positioning makes it one of the most challenging places in the world to grow grape vines. However, it works and works extremely well! So much so that this region, one of the smallest and oldest in North America is being touted as “Canada’s next great wine region”. Situated on one of the cooler climate limits for vines. Those very elements allow for cooling breezes during the warm summer months and a moderating affect on the vineyards not too far from the coast. This makes for near perfect climatic conditions for grapes to hang longer on the vine and develop more intensity and brilliance. However still allowing for that omni important acidity, critical for good structure and balance. All of this helps contribute to the style of wines Nova Scotia is becoming best known for. Wines with great acidity, lively and crisp and with bright aromatics and characteristic minerality. Nova Scotia has been producing wines since as early as the 17th century. It is only in the last 25 years that it has taken a foothold commercially and in the last decade or so is showing the world increasingly what it is capable of! While small in scope in terms of Canada’s total wine production, the province is big in heart, dedication and talent when it comes to the wineries and their winemakers! Garnering huge accolades and international attention this burgeoning wine region is producing very impressive whites as well as outstanding bubbly that many connoisseurs are saying rival those of Champagne! In terms of other wines Nova Scotia has a single appellation called Tidal Bay. A signature white wine that applies to the entire province. Just as with VQA regulations in Ontario and BC, certain conditions must be met in order to be labeled Tidal Bay. These include the use of 100% Nova Scotia grown grapes, specific grape varietals, and a blind tasting evaluation to ensure the wines show the distinctive Nova Scotian taste profile. The future shines brightly for Nova Scotia wine with one critic and co-author of The Wine Lover’s Guide to Atlantic Canada, Craig Pinhey seeing “the future of Nova Scotia wines rising as high as the Bay of Fundy’s tides”. Incidentally the highest tides in the world. A toast to you Nova Scotia and to Canada’s 150th birthday with one of your finest! Back to bubbly! Fabulous Fizz from Benjamin Bridge, Canada’s most lauded sparkling wine house! Our introduction to Benjamin Bridge came to us via a casual blind tasting of sparkling wines on a sunny afternoon. We were a little surprised, and absolutely delighted when we learned that one of our favorites came from Nova Scotia. Upon a little more investigative work including of course enjoying it first with fresh oysters and later with a light desert we felt compelled to share our latest discovery. Benjamin Bridge, located in the Gaspereau Valley on the Bay of Fundy was founded by Gerry McConnell and his late wife Dara Gordon. Long time foodies and lovers of fine wine their passion was ignited after a tour of South African vineyards. 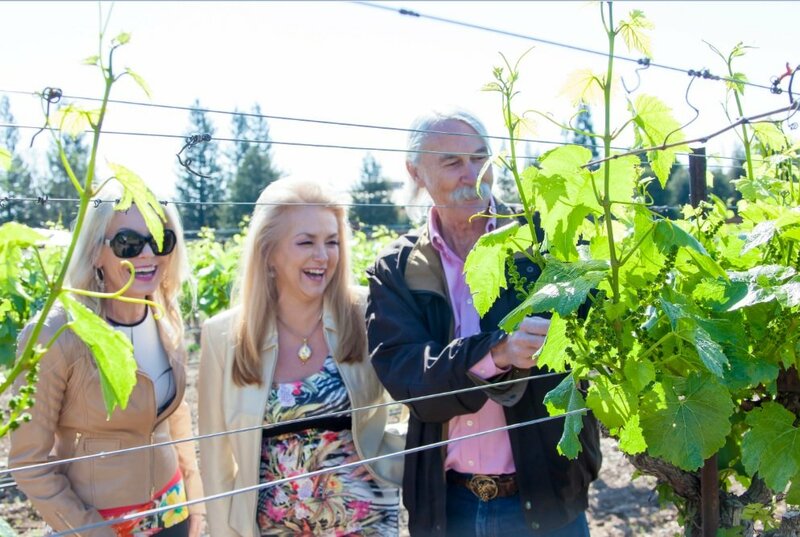 In 1999 they purchased a property with the dream to create world-class wines, back home in their native country. 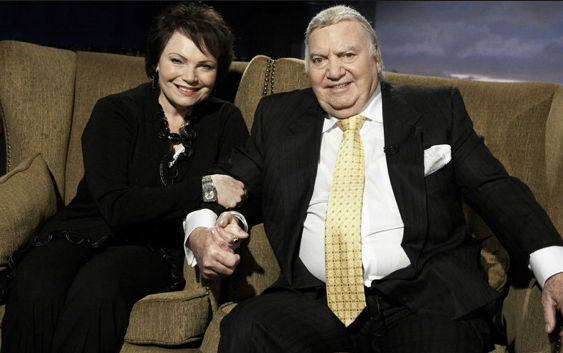 For the McConnells, building a successful business was not the driving force. As Gerry has said “It was a love and passion for the land, a love and passion for seeing things grow and to show that there could be a viable industry in Nova Scotia producing acclaimed wines” And so the journey began, with management maintaining if world class wines couldn’t be produced, Benjamin Bridge would cease to exist. Benjamin Bridge starts with a successive hire of some of the best in the business. From the first with Peter J. Gamble, a Canadian winemaking icon to assess the potential of the vineyard. Soon after joined by the late Raphael Brisbois former Chef du Cave for Piper Heidsieck, a leading authority on Champagne. 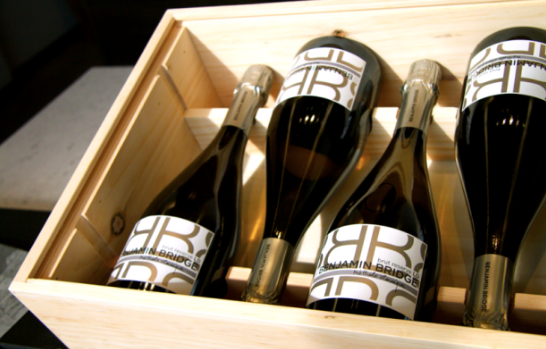 In 2004 Benjamin Bridge releases its first sparkling wine vintage to rave reviews. 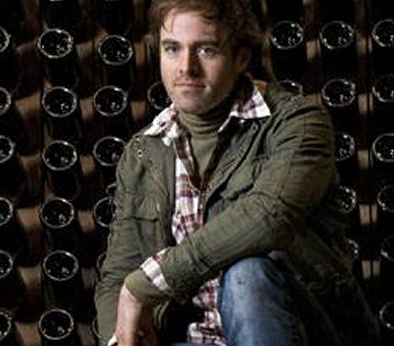 In 2008 Jean-Benoit Deslauriers comes on board as head winemaker. The vineyards are officially certified organic, and the winemaker along with Gamble and Brisbois produce Deslauriers’ first Canadian wine, the lightly sparkly Nova 7 knocking it out of the ballpark! The final analysis, the vineyards lie in an enviable position for one wanting to produce premium sparkling wines. Nova Scotia’s climate and terroir are being likened to that of Champagne, sitting within just one degree of latitude. The Benjamin Bridge vineyards are located in the heart of the Gaspereau Valley on the The Bay of Fundy enjoying a micro climate especially suited to the production of sparkling wine. Said Peter Gamble of the temperature parallels between Champagne and the Gaspereau Valley “. “It’s so close to Champagne it’s frightening,” “It all starts in the vineyards” it is often said. With the dedication and uber talent of head winemaker Jean-Benoit, his assistant and cellar master, plus the guidance of Peter Gamble. The results are heavenly bubbly and award winning wines. The team of winemakers craft the sparkling wines in the time consuming and very expensive method used in Champagne called the Methode Classique. Very laborious in the vineyards and in the cellars where the wines are bottled and aged on their lees for up to four years, patience is a virtue as the wines are carefully monitored as they develop and ready to be released. 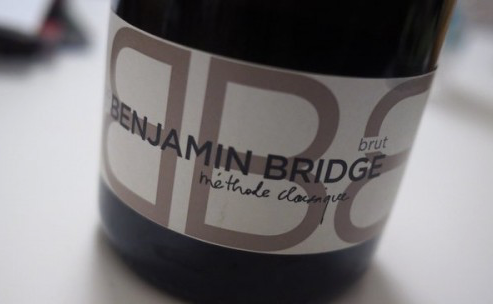 Here are a few quotes extolling the sparkling wines of Benjamin Bridge. 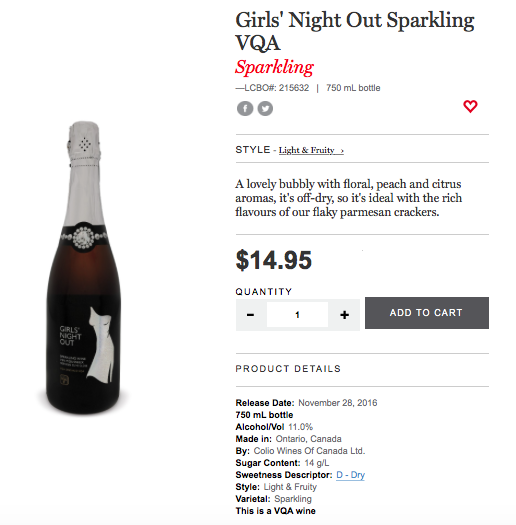 Mind blowing sparkling wines that would challenge any highly –rated French Champagne” Anthony Gismondi They are without question the best sparkling wines I have tasted in Canada “ Tony Aspler “It’s a sparkler that rivals Champagne…one of the best Canadian wines I’ve tasted. Beppi Crosariol We must agree whole heartedly, Nova Scotia you are a star and Benjamin Bridge you too are a star shining so bright for all of us fans of fine fizz and of supurb wine. Congratulations! Happy Birthday Canada, a toast to you and all of us on our sesquicentennial birthday! Please find below a review of the Benjamin Bridge Brut and the Nova 7. Benjamin Bridge Sparkling Brut 2011 Vintages: 381533 $49.95 Ontario. Produced in the Méthode Classique, or traditional Champagne method, using exclusively one of the three permitted grape varietals in Champagne Chardonnay. This luscious bubbly spent four years on the lees before its release and definitely hits all the high notes. Elegant and alluring on the nose with a fresh and bright aroma of citrus, lemon and lime, a hint of smoke and of bisquit. On the palate it is crisp, with mouth watering acidity, flavours of baked apple, more brioche and a long finish. We enjoy with lobster and freshly shucked oysters … simply divine just like in the Maritimes! The Mermaid and the Oyster in Kerr Village, Oakville. Picture here of us in shop Benjamin Bridge Nova 7 Sparkling 2016 Vintages: 256289 $24.95 Ontario. 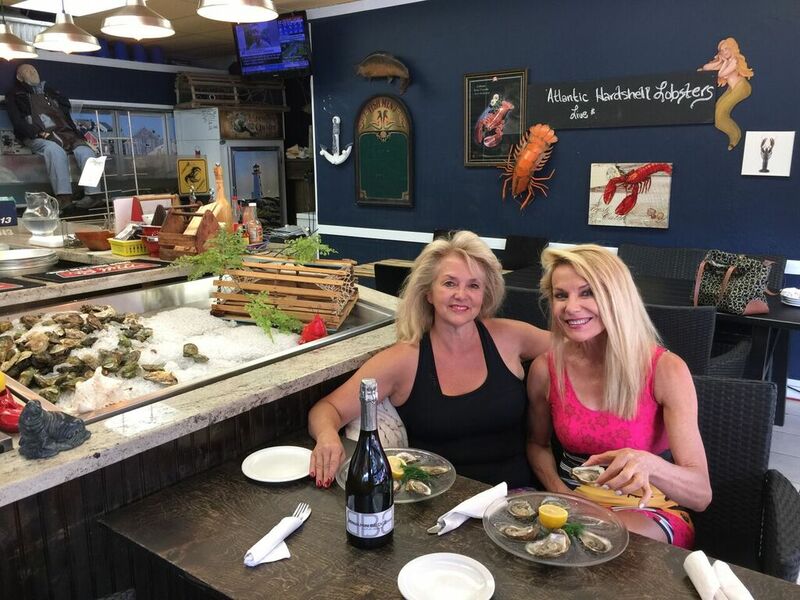 https://www.thewineladies.com/wp-content/uploads/2018/03/The-Mermaid-and-the-Oyster-in-Kerr-Village-Oakville.jpeg 768 1024 Susanne Seelig-Mense https://www.thewineladies.com/wp-content/uploads/2017/08/WineLadiesLogoTransparent.png Susanne Seelig-Mense2018-03-12 16:27:542018-06-12 11:18:05Next up we explore another exciting wine producing province in which temperatures dip well below zero. Nova Scotia. JUNO Cup, The Rockers vs. The NHL Greats, Jim Cuddy and Mark Napier. The Wine Ladies TV interviews with Blue Rodeo’s Jim Cuddy, Billy Talent’s Jon Gallant and Sarah Harmer and NHL Great Mark Napier. First published Feb 11, 2011. With less than two months to get ready for Juno Cup, presented by The Keg Steakhouse & Bar, Canada’s fearless musicians traded in their microphones for hockey sticks and sized up the competition. Some of the NHL’s greatest players during the first-ever training camp that was held at the Ricoh Coliseum. We were thrilled to be invited to witness some practice drills last week. 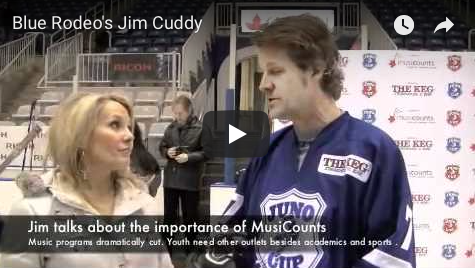 The 8th annual Juno Cup will be held On Friday, March 25th where proceeds benefit MusiCounts for music programs across Canada. Additional players for The Rockers and NHL Greats will be announced soon. Check out our interviews with The Rockers Jim Cuddy: Jon Gallant: Sarah Harmer: and NHL Great Mark Napier. Highlights of the day here. 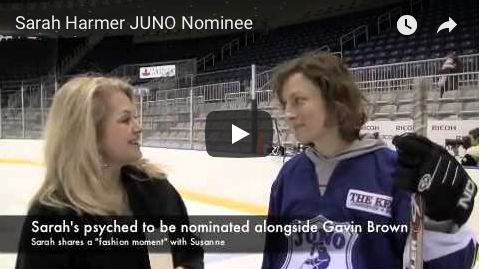 Blue Rodeo’s Jim Cuddy at the JUNO Cup drills with Georgia, The Wine Ladies TV. Jim Cuddy 11-time JUNO Award winner with Blue Rodeo. Andrew Scott and Chris Murphy Members of the JUNO Award-winning group, Sloan. Jon Gallant Seven-time JUNO Award winner with Billy Talent. Gary Roberts 89 Stanley Cup winner with Calgary Flames, and former Toronto Maple Leaf. Gary Leeman 93 Stanley Cup winner with the Habs, and former Leaf. Paul Coffey Hockey Hall of Fame, 2004. Brad Dalgarno NY Islander’s first round pick and seven-season veteran. Juno Cup will take place Friday, March 25, 7:30 pm at Ricoh Coliseum. This years’s JUNO Cup is being held March 23 in Burnaby BC. Jim Cuddy is back again on The Rockers team! JUNO Cup tickets are available at Ticketmaster. Individual tickets to JUNO Cup are priced at $20 + fees. Please note, $15 tickets (plus fees) are available when purchasing 10 or more, with all proceeds benefiting MusiCounts. https://www.thewineladies.com/wp-content/uploads/2011/02/Screen-Shot-2018-03-04-at-12.12.33-PM.png 354 530 Susanne Seelig-Mense https://www.thewineladies.com/wp-content/uploads/2017/08/WineLadiesLogoTransparent.png Susanne Seelig-Mense2018-03-03 16:46:002018-05-24 16:26:58JUNO Cup Rockers trade in their microphones for hockey sticks!